Today is a Good Day: Save game! 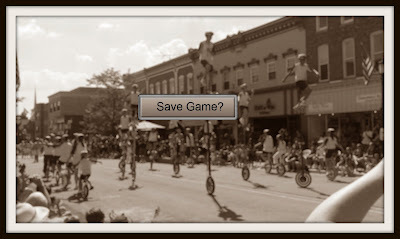 Many computer games allow you to save your game. You can then load these saved games to play later. makes sense, right? Another use of the save game is to mark your spot before you do something difficult so that, if you die, you can go back to a safe spot and try again differently. There may be times in our lives when we wish we might have a "do over" or reload a saved game. I've read that the brain reacts in the same way when you remember something as when you experience it for the first time. So, in a way, we can have a part of that save game magic when we need help to make today a good day. When something good happens in your life you should pay attention to it. You should try to capture as much as you can about that moment. You should "Save Game". Those "saved games" can be part of your tool-box to be pulled out as needed. Bad days don't have to be "Game Overs". A readily available save game can mean today is a good day.